Several consumers liked that the Asics DynaFlyte 3 was built to be durable. A handful of testers claimed that this running shoe was suitably lightweight for all-day use. The underfoot cushioning was considered by some to be very bouncy. The design and color schemes were lauded for being eye-catching. Consumers generally considered the fit to be agreeable. The sizing scheme was deliberated as true to expectations. A few consumers thought that the colorways were too vibrant for their tastes. The Asics DynaFlyte 3 was a recipient of generally positive feedback from consumers and shoe enthusiasts. People mostly welcomed this road shoe’s durable construction, lightweight design, and responsive underfoot cushioning. Moreover, they liked the width and size profiles. The color schemes were apparently in a love-it-or-hate-it situation, so it depends on the wearer if the visual aspect is accommodating or not. Asics DynaFlyte 3 - A comfortable and solid choice for the urban runner! Looking at the headline you might wonder what a "solid choice" is? Well, it is not because the DynaFlyte 3 is particularly physically solid. It is supposed to mean that you are most likely to get a positive experience running in the Asics DynaFlyte 3. Read on to understand why I think so. Be warned: I have taken the DynaFlyte 3 along on trails and in conditions for which it was never intended. I'm invariably going to compare it to my usual wide, zero-drop, low stack, trail shoes. Despite that, the Asics DynaFlyte 3 proved itself to be a rather positive acquaintance. The issue that worried me the most up front was the traditional narrow/pointy shape. Opening the box, the DynaFlyte 3 looked even longer and more narrow than I expected from my pre-review research. But I was pleasantly surprised! Putting the shoes on for the obligatory initial-around-the-house-walk, the upper material proved able to stretch laterally. Because of this, they felt surprisingly comfortable and did not squish my toes as expected. When I break in new shoes, I usually plan my first few runs in a way that allow me to cut the run short should need be. There was, however, absolutely no reason to cut anything short with the DynaFlyte 3. Only towards the very end of the 15 kilometers I ran on the first run did I feel a bit of "new-shoe-numbness". In other words: The DynaFlyte 3 was comfortable and ready to go right out of the box! This comfortable feel remained throughout the review period and only got better with usage. I'd say the break-in-period lasted some 50 to 70 km - after that, they reached a "stable state". Key to the comfort is the softness and stretchability of the seamless upper. The upper will accommodate wider feet and provide a nice snug fit without squishing your toes. Some reviewers mention this as a drawback, I see it as a huge plus! I think perhaps the people complaining are expecting more control. You can't have both lots of stretch and plenty of control. Overall I think DynaFlyte 3 is a very sound compromise for an everyday type road shoe. I normally order my running shoes somewhere between UK 6.5 and UK 7.5 - with UK 7 being so-called "true to size". According to various sources, the DynaFlyte 3 is true to size, so I went for size UK 7. They fit me rather well - at least comfort-wise. I'm, however, not convinced that they are "true-to-size"! I find the DynaFlyte 3 unusually long and my toes are clearly not getting anywhere near the front of the shoe. That extra length makes the DynaFlyte 3 feel a bit like tiny flippers. Ok, I'm exaggerating - but I need to paint a picture here! Anyway, when it comes to length I think I could easily go if not an entire size, then at least half a size down without trouble. On the other hand, I don't think my toes would be overly happy, as it would put the squeeze on an already snug fit. My recommendation to others would be to go true-to-size and accept a bit of flipper-effect if you have normal or wide feet. If you have narrow feet I suggest you go at least half a size down. The DynaFlyte 3 comes in a range of color schemes. I got the red/black model. What a stunner. They look awesome with red outsole and laces, black upper and red (bordering on pink) logo/decorations. Not an ordinary looking shoe, and I mean that in a positive way. There is something weird going on with the upper though. Normally you'd have the Asics logo on the side of the shoe. You know, those weird splines that cross to make a huge A. Somehow Asics managed to put a sort of "veil" on top of the shoe. Or as a good friend of mine put it: "... looks like a shoe inside a shoe". With the red (going on pink) markings covered in "black veil" you get a bit of a bed-chamber/red-light-district sense when viewing the DynaFlyte up close (and personal). The DynaFlyte 3 performed solidly in a range of conditions. Anything from roads, paths, parks, over beaches, gravel roads, to packed dirt trails. I would say that they are ideal for most recreational urban runners, even those who take the odd adventure on easy trails. They were no good on rugged and slippery trails. They are simply not built to be grippy, and this is quite apparent when you take them out on "the real stuff". They offered very poor grip in sandy, muddy, slippery and wet conditions. The heel stack is rather high (27 mm) and their "center of gravity" is too high for my liking when it comes to trails. I constantly worried to twist my ankles when running in difficult terrain (rocks, roots etc). This got particularly bad on river-beds and rocky coastal tracks. On roads and paths, it was generally not a problem. That the DynaFlyte 3 is not a trail shoe is further amplified by the before-mentioned flipper effect, which made the front of the shoe hit objects that I would normally not get near. I nearly fell over a couple of times going upstairs. I assume doing more miles in longer shoes would get my mind and body used to wearing "flippers". My pair of size UK 7 Asics DynaFlyte weighed in at 504 grams (after some 80 km). That is 252 grams each, or somewhere in the order of 10-25% more than my usual lightweight trail shoes. Yet, two hundred fifty grams for a normal, cushioned running shoe is towards the light end of the spectrum. This lightness is reflected well in the speed. I found the DynaFlyte 3 to be quite fast. Not the fastest, but still faster than most. Not a racing flat, but leaning towards it. You are not going to set a world record in the DynaFlyte 3 - but you'll go faster than average and your feet are comfy while doing it. The upper consist of a nice looking, well-ventilated open-weave fabric which overlays a softer and cushioned "inner"-upper. This seamless two-layer construction allows your feet to breathe and moisture to escape readily. The upper fabrics are very laterally stretchable and this prevents your toes from being squished - despite its otherwise rather narrow form. The upper is not built for trail conditions as the open weave fabric allows water, sand, and grit to easily get inside the shoe. It sometimes felt like they actively absorbed moisture (e.g. dew on the grass/undergrowth). Wearing gaiters was pretty much useless, as water, grit and "nature" simply got through the open weave instead. Structurally the upper feels slender, and it offers very little protection against rocks and roots. There is a wee bit of a toe-bumper, but that's about it for structural bits to protect your feet. The laces are reasonably flat. They are set in a normal configuration and together with an amply cushioned tongue, they provide a nice, tight, secure yet comfortable lock-down of your feet. No inside-shoe-sliding issues of significance in urban conditions. In rugged, technical trail conditions with plenty of directional changes and small side-steps, the DynaFlyte 3 is not performing overly well. I had to tighten them way too hard to feel secure. Otherwise, my feet slid around inside the shoe (basically stretching the upper). We're back to the compromise between control and stretchability - and again this is not a trail shoe, so comfort should weight more than control. I found that the DynaFlyte 3 offered a nice cushioned/soft ride, with plenty of spring in the step (bounce-back). Plus they were very comfortable. This will allow you to go for longer runs. I took mine as far as half a marathon, and I wouldn't mind going farther with the DynaFlyte 3. There was the mere indication of a slightly annoyed right pinkie-toe towards the end of that half, but that was about it for discomfort. The Asics DynaFlyte 3 is sitting at a medium-to-high price-point. A bit of research and you'll be able to find it on the web for somewhere around USD 125. Not cheap, but not extremely expensive either. During its first 100+ kilometers, the DynaFlyte3 showed very little wear of significance. The outsole, upper, cushioning and stretchiness was all intact. Based on that experience - and in particular my experience with Asics shoes in the past - you'll get your moneys worth with the DynaFlyte 3. Sure thing! Despite the above wealth of complaints and general gobbledygook about trails, zero-drop, and what-have-you - my overall impression with the DynaFlyte 3 is very good. Nothing really to dislike. It is a nice well-rounded and "whole" unit. Not like some running shoes which are more like a bunch of features put together in random order without thought to the final product. I think that very few runners are going to take offense by or hate the DynaFlyte 3. On the other hand, I also feel that Asics with the DynaFlyte 3 has taken very few chances, and gone with safe choices in technology and materials. It is all very dependable and solid, but also a bit boring - in a good way. A mainstream mass-market type shoe. The DynaFlyte 3 is a good and comfortable running shoe. A shoe suitable for the urban runner used to neutral running shoes with a medium heel-to-toe offset. It offers a reasonably fast and light ride in a well-ventilated and nice looking package. It is suitable for both short and long runs, even ultras. Trail and "natural" runners should look the other way - it is not a trail shoe and has plenty of cushioning and a considerable heel-to-toe drop. For everybody else, the Asics DynaFlyte 3 is recommended as a versatile and solid everyday trainer. A shoe that will last you long and give you many enjoyable miles of running in comfort (and style). NB! There might be a size-issues (too long), so better try before you buy. Asics Dynaflyte 3: Truly fast or painfully slow? I’m a tall, medium build, fore-midfoot striker and I train mostly in barefoot/minimal shoes. But I’ll try anything once! Initially, I was nervous yet excited about testing out this attempt at a lightweight road shoe by Asics. Now I don’t have much experience of Asics but the small amount I do have hasn’t been very good. The pairs I've worn before have felt quite heavy on my feet and also quite clumsy to run in. The Gel Kayano 25 I tested a little while ago were very uncomfortable and actually ended up injuring my feet when I ran in them. I had high hopes for the Dynaflyte still. They seemed more like something I could smash some serious miles in. A lower drop than usual (though not exactly flat) and fairly lightweight. I was hoping they would show me a different side to the Asics I had come to know. But at the same time, I was nervous that these would disappoint me or hurt my feet again. None the less I was eager to get them on my feet and take them out for a spin. I felt the need to add a new section into my reviews after wearing this shoe. Sometimes the shoes I test have no break-in period (winner winner chicken dinner!!). Sometimes they do and sometimes they just never seem to break-in at all. Initially, these speedy road running shoes seemed very comfortable. They fit perfectly and they hugged my feet and held them firmly in place. All good things, all good things (Olaf would be proud). But about two miles into my first run until about eight miles into my second ten miler my feet were in quite a lot of pain. I was experiencing very sharp shooting pains at the point where I land, on the outside of my forefeet all the way across to the other side of my forefoot and into my arches. I feared the worst as the Dynaflyte seemed to be emulating the Kayano and the last thing I wanted was to end up injured! I can't be sure of what was causing the issue but after around twenty miles and quite suddenly the pain stopped. Either the sole adjusted to my feet and bed in, my feet adjusted to the shoes or I subconsciously adjusted my running style. Whatever happened I was glad it was over. 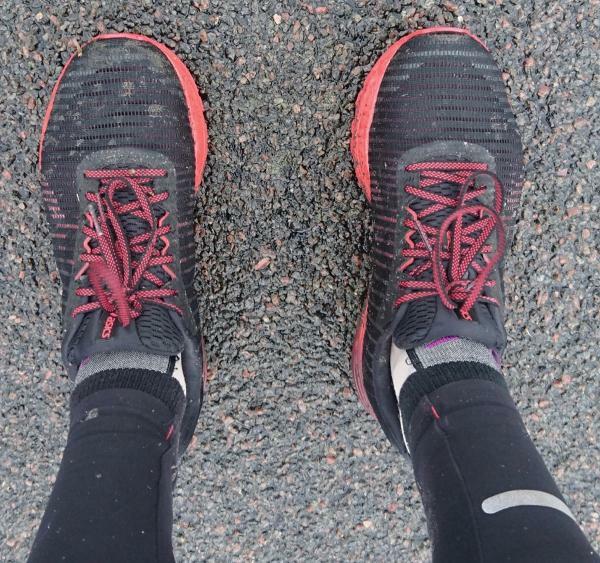 From that moment on I began to enjoy these road shoes and felt I could actually start to review them properly. Design-wise, I think these shoes are fairly ugly. I mean I don't hate them but the colors of the pair I got just don't work for me. The design is also a bit unimaginative. But I doubt very much anyone is going to be buying the Dynaflyte to wear about town. The design here is definitely functioning over fashion and I am a fan of that! This road shoe from ASICS has a reasonable heel to toe drop. At 8mm it's hardly flat but I did notice the difference from the typical 10mm drop a lot of running shoes have these days. It's still a bit high for me but I don't mind letting it slide this time. The Dynaflyte is designed to be a fast shoe. But honestly, I didn't really get that impression from them. I'm not saying that this is a bad thing though. I found they were pretty great for steady long runs as they provide ample comfort (after the break-in period) yet they're not overly heavy. But they wouldn’t be my go-to shoe for speed work. This pair of Asics road shoes are quite responsive but a downside to the sole being so thick with foam is that it's more difficult to adjust to defects in the running surface. Because of this, I did come close to rolling my ankle a couple of times. A slightly softer, more amenable sole would have made this shoe so much better! The Dynaflye’s upper is a multi-layer mesh. It has really good airflow and I haven’t found that my feet ever get too warm in them. One downside to the upper is that it’s not very stretchy but it doesn’t feel too restrictive. Since having worn the Nike Epic React Flyknit I haven’t come across anything that’s anywhere near as awesome in regards to its upper. Unfortunately, the Dynaflyte isn’t any different in that respect. What you have here are some pretty decent laces. They grip well and don’t come undone on their own very easily. The Dynaflye has a very stiff plastic insert in its heel. Although it does lock my heel in really well and gives a lot of support I would still rather it was more minimal and flexible. Because it’s so substantial it must add weight and weight is something I am not a fan of. These road shoes have a very thick collar. It’s definitely more than is necessary but I can’t deny how comfortable it feels around my ankle. When it comes to the collar on a shoe, less is always more. The tongue on these shoes is decent. It’s not too thick but it’s padded enough and comfortable. Even though the upper isn’t sock-like the tongue keeps debris out well enough. There are no real safety features to speak of on these road runners. They have plenty of reflectivity going on so your feet won't ever go unseen at night time but I’ve always thought of reflective strips etc as a bit more of a gimmick than anything. The sole on the Dynaflyte comprises of a removable insole, a foam midsole (there's some gel in there somewhere too) and a durable rubber outsole. The sole has an 8mm heel to toe drop which is still a bit much for me really but it's nowhere near the worst I've run on. The foam is quite reactive but not massively impressive if I'm honest. I didn't find these shoes to be very nippy at all really. Though as I've said already they definitely feel better over longer runs as they do absorb the shock well. The gel as far as I can tell is in the heel but as I land on my mid to forefoot I can really say what this actually does for better or worse. The Dynaflyte have a load of support. If you like a lot or need a lot then these will really suit you. It's not as abundant as on a dedicated support shoe but it's still pretty hefty. They're not really for me in this area though and because there is a fair bit of arch support I have a feeling this is why my feet took so long to adapt. The heel locks my feet in really well and I do feel secure in these. There's definitely no risk of your feet moving about in them. The Dynaflyte are not flexible. There's no way to sugar coat it, they just aren't! The sole is thick and stiff, that's about all there is to say about that. The tread here is adequate on the road but that's about all. It's quite flat along the whole sole. I actually quite like that about it, it's not trying to do too much or be too fancy. Plus points there! I'm not sure of what rubber the sole is made out of on this road shoe but it grips well. Not outstandingly well, but it's good enough for my needs and probably most other people too. This sole isn't going to grip on much else than the road but I really don't think it needs to! I can't deny that these road shoes from ASICS are comfortable. As much as I dislike the padding and squishiness and all the other frills thrown in with these shoes they feel flippin’ amazing on my feet! I haven't had a single hotspot or blister and my feet fully locked down when I'm running in these. Although not massive the toe box on the Dynaflyte it doesn't feel too restrictive. I think it still could have been better with a stretchier upper but I can't knock it too much. I mean it's still a different shape to my actual foot but you can't win em all! I mean what can I say, I hate it! But I love it too. But I'll never admit it! No, but seriously, there's way too much going on back there and yet it works so well! It really is a love-hate part of this shoe for me. I can't even properly put it into words. Stuff it! I'm going to have to just admit that it does what it's meant to and it does it really well! Although the Dynaflyte has been a slow burner they do perform well in general. They're not slow shoes by any means and they're great on longer runs. I really enjoyed my ten miles in them on the road. They didn't feel heavy and are responsive enough that I didn't feel as though they were slowing me down. This is where these shoes excel. Wait, who am I kidding, this is the only place you'll be able to run in these. But hey who needs one pair of shoes for every terrain? More reason to have more shoes, wooo! That's a negative. I mean they'll be ok for very minimal light trail use but not in the wet and certainly nothing more extreme. Although built for speed I don't find them to be great for it. They're not terrible but they don't come close to the Epic React Flyknit or any of my minimal shoes. All I'm going to say is, racing flats are called racing flats for a reason. These are not flat. The Dynaflyte says it's good for all distances and it's not lying. It's a great long distance shoe. It's lightweight enough that over long runs it keeps my feet moving and comfortable enough that I don't want to stop running in them. Your Dynaflyte 3 is nearly perfect. Drop the heel by another 4mm, lighten the foam sole a bit and put a sock style, knit upper on them and they might just be the fast shoe they're intended to be! Hell, I'd even let you keep that hefty heel!! The Dynaflyte 3 is a solid road shoe. It performs admirably over a decent range of distances. Though it's not the lightest or the fastest or the most reactive or flexible, it does everything well. Sort of a jack of all trades, master of none really and very pleasing to run in. 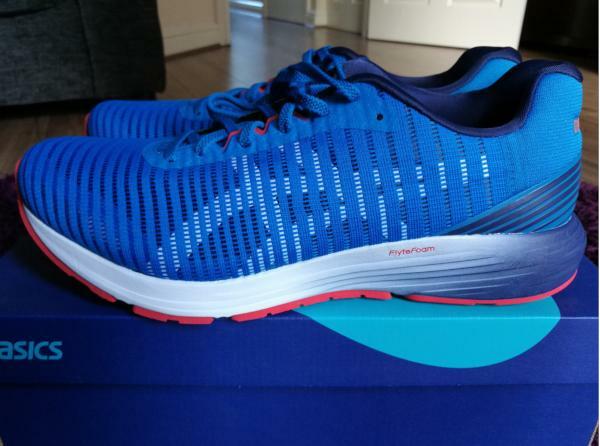 The DynaFlyte 3 may be a bit to roomy and unstructured for some feet and faster paces although once I added thick socks to my true to size I even ran some trails in them with more than adequate support and great trail feel. The Asics DynaFlyte 3 is an update to a relatively fresh series of daily running footwear that’s meant for the neutral pronator. It makes use of technologies that ensure a snug yet secure in-shoe experience. The upper unit has a stretchy mesh that evokes a glove-like wrap. Asics has created a new midsole material, the Flytefoam Lyte. This full-length cushioning platform is made from environmentally friendly materials and is designed to be sturdy yet responsive. Along with the Gel® cushioning unit in the heel, this technology aims to maintain a smooth transition through the gait cycle. The Asics DynaFlyte 3 was created using the standard measurements. When it comes to size, runners can get one using their usual expectations. Widthwise, the available options are D – Medium for men and B – Medium for women. The semi-curved shape of this running shoe’s last and the form-fitting configuration of the upper unit allow the natural curve of the human foot to relax inside the interior chamber. The outsole unit of the Asics DynaFlyte 3 makes use of AHAR® or Asics High Abrasion Rubber. This offers traction and protection against the abrasive nature of the surfaces. Flex grooves allow the platform to bend in conjunction with the joints of the foot as each step is taken. These shallow trenches also heighten the grip on the ground. Underfoot cushioning is the responsibility of the Flytefoam Lyte, which is a bouncy unit that runs the entire length of the Asics DynaFlyte 3. It is lightweight and is made from environment-friendly components. The back portion of the platform makes use of the Gel® cushioning unit. This silicon-based compound has the job of attenuating impact shock during the landing phase of the gait cycle, thus preventing the ground forces from causing any discomfort. The Guidance Line is a vertical groove that goes from the heel to the forefoot of this shoe, and its goal is to lead the foot towards a well-grounded shift from the heel to the toe as each step is taken. The Impact Guidance System or I.G.S.® is composed of the entire constituents of the cushioning system, as well as a platform design that encourages the natural rolling motion of the foot. A rounded heel configuration mixes with impact-isolating grooves to ensure agreeable steps. The Ortholite® X-40 Sockliner offers additional cushioning and breathable support for the underfoot. Furthermore, it has anti-moisture properties that prevent bacterial buildup and odor. The Adept Mesh is comprised of a stretchy mesh that’s meant to cover the foot in a form-fitting manner. It is also designed to accommodate the natural swelling of the foot as the running session takes its course. The alternating thick-and-thin weave encourages breathability. Discrete eyelets that are reinforced by a thin overlay assist the wearer when it comes to adjusting the tightness or looseness of the fit.